Print, copy, scan and fax up to 11" x 17" (Ledger Size) for added impact. Print two-sided color documents up to 11" x 17" in-house. Easy to setup wireless (802.11b/g/n) or wired Ethernet network with embedded web management. 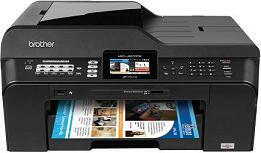 Fax, copy or scan with the up to 35-page automatic document feeder. Uses Super High Yield (XXL series) replacement ink cartridges (approximately 2,400 pages black and 1,200 pages color. Up to 11" x 17" Duplex (2-Sided) Printing. For creating professional, high impact, two-sided documents. Also saves paper. Print, copy, scan and fax up to 11" x 17" (ledger size). For high impact business documents. Uses Super High Yield (XXL Series) Replacement Ink Cartridges. Save More, Print More with Super High Yield Ink Cartridges. LC79 XXL Series replacement ink cartidges provide approximately 2,400 pages (black) and 1,200 pages (color). Our efficient 4-cartridge system means that you only change the cartridge that needs to be replaced. Fast Print Speeds. With speeds up to 35 ppm black and 27 ppm color (Fast Mode). Up to 12 ppm black and 10 ppm color (ISO/IEC 24734). Large Paper Tray. Up to 250-sheet paper tray capacity. Powerful scanning software. Allows for scanning directly to your media cards. Single sheet bypass tray. Allows convenient, straight through, single sheet feeding for up to 11" x 17" paper, envelopes or thicker media. 2-Year Limited Warranty. Provides assurance and reliability.